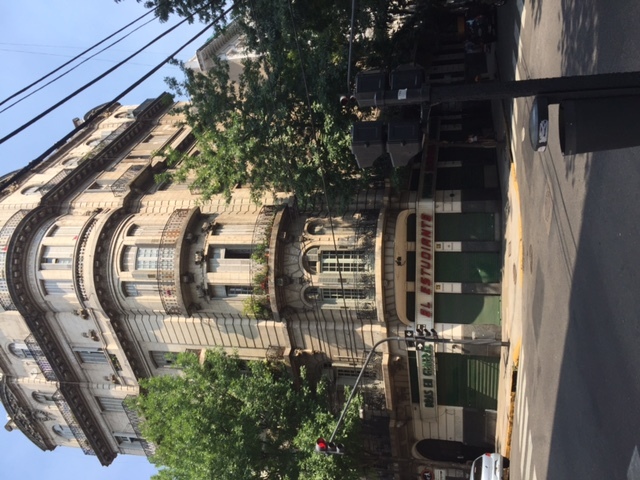 We have three days in Buenos Aires before we meet with the rest of the Horde for our cruise. It’s a beautiful city, full of old colonial buildings and Beau Arts apartments and absolutely fantastic food. We’ve got mark’s younger sister and her family with us, so our plans include a lot of walking to admire the lovely architecture, with frequent t stops for helado (gelato) in the heat. And it is HOT. At least for us poor northern tourists. Uppers 90s and humid enough to leave us dripping and cranky. I totally understand the whole ‘afternoon siesta’ thing that South America has going on. By two,in the afternoon, we were all ready to just bag it and nap in the air conditioning. Which we thankfully have. It was one of the criteria for our BNB. We are staying in a terrific 19th century building near the national congress. We are on the second floor, bedrooms and a lovely balcony. The girls love it. Twelve foot ceilings, gold leaf chandeliers, good restaurants and bakeries only a few blocks in either direction…it is a great place! A bakery down the street has fresh bread, pastry, and alfajores cookies (which we tend to eat for breakfast. We’re on vacation!). A subte (subway) station is within a block. The neighborhood might not be the upscale shopping you’ll find in Palermo, but it’s a lovely place to stay. We might not be walking around after dark–usually because we are done and asleep by none, in comparison to the porteños (locals) who are just getting ready to go out. In general, Buenos Aires is a safe place, petty crime is the primary worry, but there are places that tourists should not walk at night. Most of those areas are in the southern suburbs. Two nights here, then we trek off to meet the rest of the family. We are enjoying the relative quiet and the ability to decide our own plans!